Since my last check-in, I might be a few brewery reviews behind… We’ll call “a few” 26. I’m now up to 35! Not too bad! So first things first: Breweries 10, 11 and 12. Before I departed for my Colorado “beercation”, I hit up a few breweries. Let’s check them out! 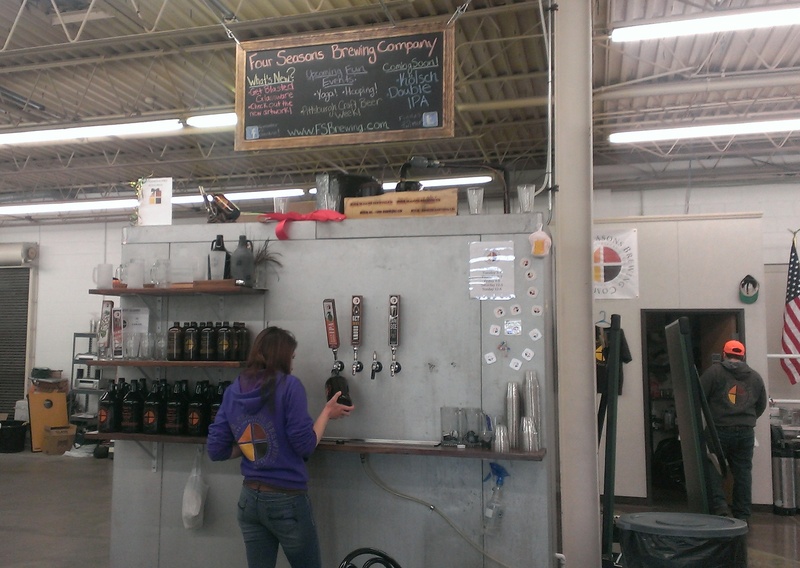 #10: Four Seasons Brewing, Latrobe, PA on March 1. They just opened in November, and you can tell these guys love beer and love what they do! They have a small tasting bar in their brewery where you can sample their current beers or fill up your growlers. There’s no bar seating, which is pretty common for a newer production brewery. We knew this and figured it would be a 5 minute stop to sample and grab a growler, but it was an inviting place, so we were actually there for a while. We talked to a few employees there who poured us some samples and gave us and a few others a small tour. They told us they’re already working to purchase some new equipment to keep up with the demand for kegs of their beer. I tried their Dark Side of the Pint Oatmeal Stout, Get Down Brown, and their High HOPeS IPA, all of which were well-done, though the IPA was my favorite. The space they have is very open, and one of my favorite things about our visit was when one of the guys giving us the mini tour told us that he loved the open space because some of the brewers bring their kids into the brewery because there’s a lot of space for them to throw a ball around and just play while they work. 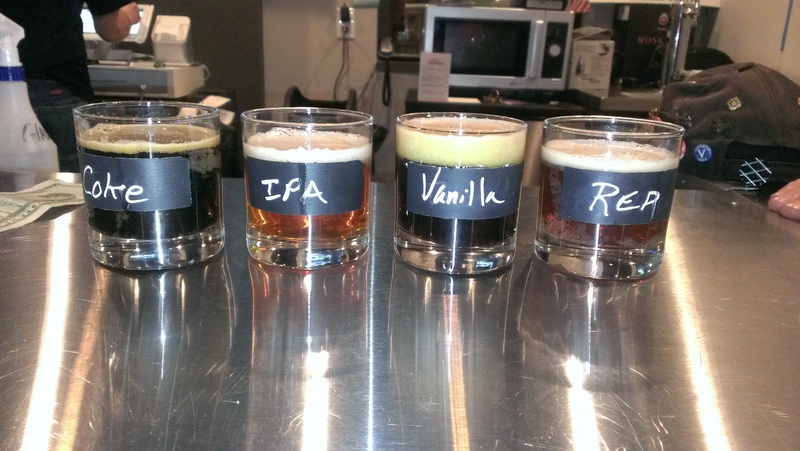 #11: Full Pint Brewing, North Versailles, PA on March 1. Ben and I stopped here and met a few friends before hitting up an Avett Brothers later concert that night. If you’re going to check out this brewery, good luck figuring out how the hell to get into the building! Just keep trying doors; it’s worth it! This is a great tap room with a sit-down bar, tables and food, attached to the microbrewery. 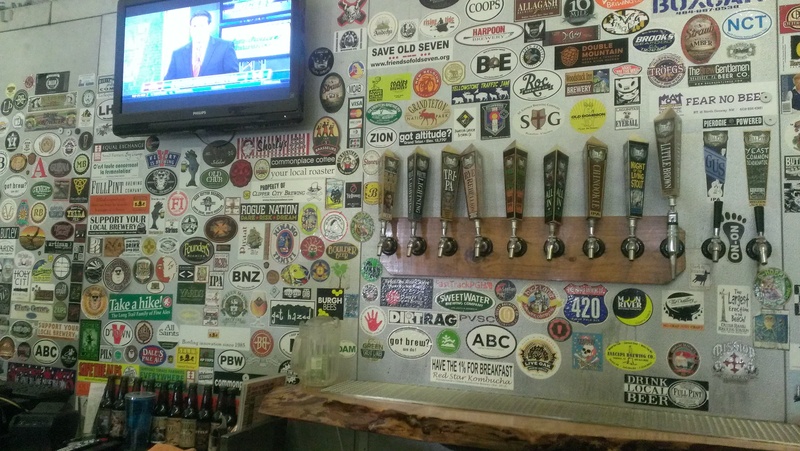 The wall housing the taps behind the bar is adorned with hundreds of brewery stickers from all over. The food looked fantastic, but we didn’t get the chance to try anything. We saw what looked like fresh basil being chopped, and it’s always refreshing to see good, fresh food being prepared at a place where food probably isn’t the primary source of income. I’m definitely a bit of a foodie, and you can tell that someone here clearly is, too. Definitely trying the food next time! Now, for the beer: They probably had about 8-10 beers on tap, and I tried seven. My favorite was the Rye Rebellion (4 stars on Untappd). At 11%, this double stout is a winner. The Paw Paw Berliner Weisse was a close second with an upfront sour punch. We also got a little mini “tour” of the brewery. A good stop. 11.5? Every so often, we go to check out a brewery’s tap room, only to find that the brewery isn’t actually at that exact location. As it turns out, Rust Belt’s actual brewery is about a block away. Ben and I sat at the bar at the tap room questioning what this meant in my brewery count. Verdict? Any “brewery” I wandered into where this was the case (no actual brewery on-site), I would classify as an “honorary half”. This means that I’ll note the visit, but we technically don’t count it toward the total. If I rack up 6 “honorary half” visits, it doesn’t add up to three. It sadly equals zero. Doesn’t make sense? Well, math was never my strong point. Nothing too outside the box here, but all solid beers. They had four beers on tap, and obviously, I tried them all. Frackin’ Porter was my favorite. All 3.5-4 stars on Untappd, which is in the realm of “good stuff that I’d order again”. #12: Hoppin’ Frog, Akron, OH on March 11. Ben and I were arriving to Akron later in the evening for our flight to Colorado the next day, and we knew we were pushing it on time to get to this one. We saw on their website that the tasting room closed at 11, and we got there right around 20 till. We hurried in and took two seats at the bar just as the bartender was announcing last call. Whew! Just in time. It was “Tower Tuesday” where they infuse two of their beers with various ingredients in the towers. 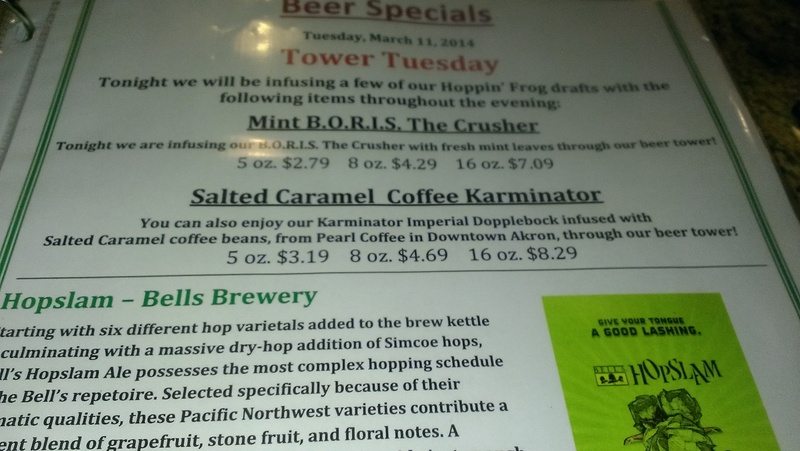 I saw the beer, Salted Caramel Coffee Karminator, and knew it was the one I wanted to order for last call. First of all, salted caramel is something I always say “yes” to. Always. Coffee? Um, yes, please! One sip, and I was in love. I would have given this beer ten stars on Untappd if I could have. With confidence, I can tell you that this is one of my ALL-TIME FAVORITE BEERS. Outstanding. I’m not sure if any Tower Tuesday beers ever make it to the bottling line, but this would be toward the top of my wish list if ever it was bottled. It’s an imperial doppelbock, and I think that was the best choice for this infusion. The lager lets the flavors speak for themselves and come through clear, and the choice to make it a doppel gave this beer the alcohol kick to stand well with the infusion. I’m sure the Karminator without the coffee bean infusion is a great beer on its own, and I’m anxious to try it sometime. Being a lover of coffee and salted caramel, I immediately made arrangements to stop by the local Pearl Coffee the next morning to pick up some of those flavorful beans. I’m usually into beans that can stand strong with their own intrinsic flavors, but you KNOW I can’t say no to salted caramel. I would love to do a small batch of homebrew aged on these beans during a secondary fermentation as opposed to an infusion (which I’m assuming occurs for only a few hours to a few days). I’m curious to know how the salted caramel flavor would hold up in the beer when it sits on the beans for a few months. I love the choice of a doppelbock, but I’d be interested to check this out in an Irish stout. This would make for a drier beer that would really let the coffee and its flavors stand on their own. It would have a lower ABV with a natural bitterness that would ensure that the bitterness from the beans didn’t get lost. I highly doubt I could create anything better than Hoppin’ Frog’s beer, but it’s always fun to reimagine a beer. The other beer I tired at Hoppin’ Frog was the D.O.R.I.S. the Destroyer Double Imperial Stout. Another easy 5 stars. Fantastic. I wish we had hours to spend there trying other beers, because great beers like those don’t just happen by accident. I’m guessing I would have uncovered some other phenomenal brews. We did take home a pumpkin ale that I’m really excited to try. They were out of bottles of the barrel-aged pumpkin, or one of those would have come home with us, too. I can’t say enough great things about this brewery from my 20-minute experience. I will, however, say that I have seen Hoppin’ Frog bottles before and passed them by every time. The cartoon frog on their bottles always seemed a little rudimentary to me, so I never gave the beers a shot. My brain is sometimes hard to turn off “marketing mode” where we make decisions (and money!) based on appearance. Lesson learned. Drink all the beer. Oh! Aaaaand… I may have heard that Hoppin’ Frog is going to try their hand at some sours soon! Hoping this is true because I’m all in! With 21 GABF and World Beer Cup awards under their belt, I’m excited to start trying more of their beers! I’ll leave you with those reviews to contemplate so you can anxiously await the next post on my Colorado beercation! I can’t wait to write about that trip and relive all of those phenomenal breweries with phenomenal beers! Blog fuel: Goose Island Halia, Flying Dog Mint Chocolate Stout and Crooked Stave Vieille Artisanal Saison. Halia is my favorite of these, but ALL are GREAT choices. Halia is a farmhouse ale aged on peaches and it’s refreshingly tart. Flying Dog’s Mint Chocolate was an experimental beer that just made it to bottles for Flying Dog’s Brewhouse Rarities. I don’t usually describe stouts as “refreshing”, but the mint does that for this beer! And the Vieille is a solid saison from an absolutely outstanding brewery.